In the frame of our Check-In Budapest curatorial visitor program, we invite internationally renowned experts in the field of contemporary visual art to Hungary for a curatorial research trip: the directors and curators of biennials and art institutions, freelancers, independent scholars, art critics writing for international journals, as well as art historians and occasionally artists. The goal of the program is to facilitate international art professionals to become acquainted with the actors and current trends of the Hungarian art scene. We tailor the program according to each participant’s particular areas of interest, arranging visits to artists’ studios and institutions, as the personal meetings provide the unique opportunity for recognizing the affinities between each other’s activities and for intensive dialogue. Through public lectures, the invited guests can further introduce their research areas, current projects and their own art scenes. The program has resulted in a number of partnerships and projects with the invitation of Hungarian artists to participate in international biennials and other exhibitions. As Hungarian partner, ACAX co-ordinates and supports the artists’ involvement in these significant events, assisting also in the production of new works. The program operates by invitation only. The photography section of the Check-In Budapest program is supported by the National Cultural Fund (of Hungary). 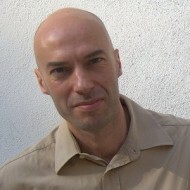 BOSHKO BOSKOVIC, Program Director of Residency Unlimited (RU), New York.